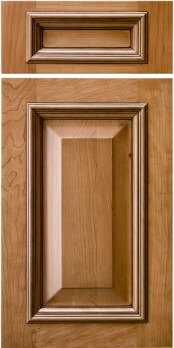 Staffordshire is perhaps one of the most distinctive and handsome doors we offer. Because it is an applied molding door AND the excess thickness is towards the door’s face, the door has a truly massive and thick appearance. This door is at home in kitchens with tall ceilings and open floor plans where its mass wont draw the room down. This door is perhaps the most ‘French Country’ door Conestoga offers.